In 1948, Salem Teachers College consisted of one building, the Sullivan building. From that institutional landmark came a world-class educator named Dorothy “Dot” Foley ‘48. For Dot, education was everything. Serving as an educator and principal for more than 40 years, her career saw many achievements, most notably writing the grant for, and then serving as principal of, the Garfield Magnet School in Revere. Under her leadership, the K-8 Garfield School was nationally recognized as a model for integrating a culturally diverse city. During that process, many believed that had it not been for Dot, the success of the Garfield school programs would never have happened. Not only active in her community and her schools, Dot was also a fixture on campus at Salem State. She served for over three decades on the Alumni Association’s Board of Directors and was also a founding member of the Friends of the School of Education. “Dot Foley was a great mentor to me with my board work and the Friends of the School of Education. She was an outstanding individual first. Everything else she did just followed her. I always felt like I had her support, her energy was remarkable” said Pat Libby ’71, president of the Friends of the School of Education. Always with a thoughtful question or a kind word, Dot was a mainstay at campus events, meetings and other celebrations. She served as a friend to many and an inspiration to many more. It’s fitting a classroom in the Sullivan Building bears her name, as the countless educators who have passed through those halls carry the same traits she did: compassion, thoughtfulness and dedication to name a few. In July 2018, just after celebrating 70 years since graduation from Salem Teachers College, we were stunned to learn of the sudden passing of Dot after a brief illness. She was a tireless advocate for our school and its programs. A friend to Salem State in the truest sense of the word, Dot was a champion for the importance of a quality education, something we were founded on. Dot will be sorely missed, but we take a small comfort in knowing that her legacy will live on for generations of Salem State students to come. It is with great sadness that Bridgewell announces the death of its president and CEO Kelly J. Martin ‘07G, who earned an MBA from Salem State. She passed away peacefully on Aug. 18. Ms. Martin joined Bridgewell as a college student 35 years ago. Even at a young age, Ms. Martin knew she wanted to be part of an organization that was empowering people with life challenges to lead self-directed and independent lives. Ms. Martin’s impact on the organization was immediate; after starting as a direct support professional she quickly advanced in a variety of direct care, management and leadership roles. As chief operations officer, Ms. Martin oversaw the growth and expansion of services to meet families’ needs, such as developing Bridgewell’s autism division and establishing three separate day programs and 10 community residences in just five years. In addition, Ms. Martin played a key role in the successful merger with Project COPE, expanding Bridgewell services to include substance use disorder and recovery programs. In September 2017, Ms. Martin was named president and CEO of Bridgewell after serving in an interim role as the successor to Robert S. Stearns. Ms. Martin earned a Bachelor of Arts degree in Social Work from Suffolk University in Boston and an MBA from Salem State College. She was a surveyor for the Commission on Accreditation of Rehabilitation Facilities (CARF), a member of the Association of Developmental Disabilities Providers (ADDP) Board of Directors, the North Shore Chamber of Commerce Board of Directors, The Providers’ Council Board of Directors and member of several committees of ADDP, The Providers’ Council and the Association for Behavioral Health. Ms. Martin is survived by her husband, three daughters, stepson, mother and brother. Eileen "LeeAnn" A. Ball, 85, passed away after a sudden illness, surrounded by her family, at the Kaplan Family Hospice House in Danvers on July 4, 2018. She was an administrative assistant at the Salem State library. LeeAnn had a witty sense of humor and laughter followed her wherever she went. She was an accomplished artist and published poet. She enjoyed the quiet of the beaches, but also loved gambling and was ready at a moment's notice to go to a casino! She will be fondly remembered by all who knew her. Mary C. Cavallaro, 86, of Medford, passed away suddenly at home on June 2, 2018. Born in Everett, Mary was a lifelong resident of Massachusetts and spent her time between Medford and Cape Cod where she had homes. Upon graduation from college, Mary taught chemistry and physics at Salem State College until she retired. Mary enjoyed traveling during summer breaks to far away destinations. She loved to see the world and had so many great stories to tell from all her travels. William "Bill" C. Clark, 80, died on June 18, 2018 at Care Dimensons Hospice in Danvers. He grew up in Maine, and in Montebello, Calif. Bill attended college at the University of California at Berkeley, which is also where he received his PhD in romance languages. In Bill's working life, he was a French professor, mainly at Salem State University. He had a million entertaining stories about Salem, but those stories, even at their funniest, always showed a respect for his students, even in those students' neophyte struggles with French. The French language might have been unforgiving, but Bill himself was the most forgiving person you could ever have the good fortune to know. Mary E. Devine, 79, died on April 24, 2018. Born in Chicago, Mary attended St. Scholastica High School where she was an award-winning debater. She graduated with honors from Loyola University Chicago where she continued to debate and served on the school newspaper. Mary received her PhD in English Literature from Loyola. Her specialty was the works of Henry Fielding. Mary was an English professor at Michigan State University in East Lansing, Michigan, for several years before relocating to Massachusetts where she was a professor at Salem State University until her retirement several years ago. Mary wrote a series of travel books under the name of M. Elizabeth Devine. She appeared on the David Letterman Show to discuss her books. Francis "Frank" P. Devlin, 78, passed away peacefully on March 17, 2018. He received his B.A. from Mount St. Mary's University, an M.A. from Niagara University and a PhD from Indiana University Bloomington. Frank taught at the college level for 33 years: six at College of the Holy Cross, one at Roger Williams University, and 26 at Salem State University. At Salem State, he founded the University's Writing Center, establishing a training protocol for graduate and undergraduate writing tutors that flourishes to this day. Frank's affinity for good writing made him a valued editor of scholarly works, especially by Salem State faculty, who continued to call on his expertise long after he retired in 2000. Jeanne Cassidy Duffy, 92, quietly passed away in May 2018. After graduating from Manhattanville College, she started her career as a nurse and eventually elevated her love of nursing by becoming one of the founders of Salem State Nursing Program. Jeanne had close friends in all aspects of her life: wonderful neighbors, tennis buddies, and work partners. She will be deeply missed and forever loved. Marjorie Ruth Empacher nee Paisner, 88, of Marblehead, passed away peacefully on Feb. 27, 2018. She graduated from Wheaton College in 1950 and went on to earn a master's degree from Syracuse University and later a Doctorate of Education from Boston University. 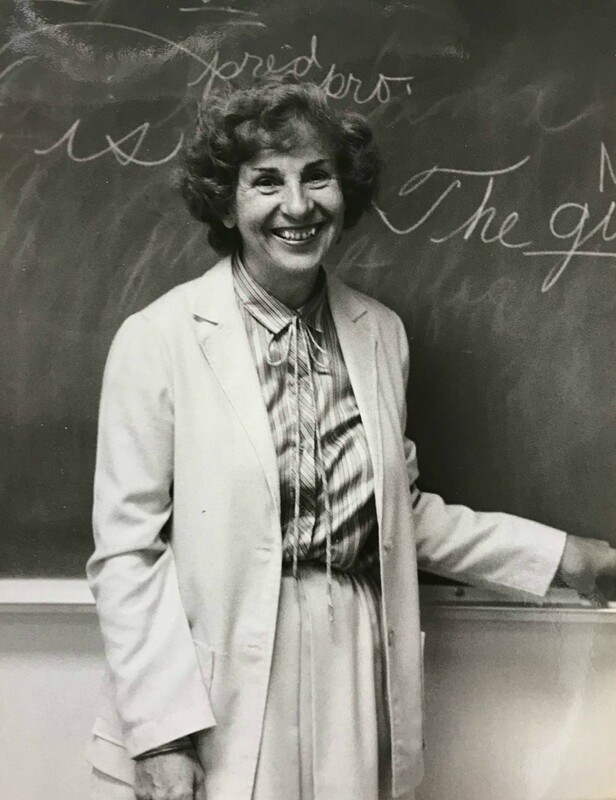 After teaching reading in Swampscott High School, Marjorie became a professor in the Education Department at Salem State University, where she taught for over 30 years. She specialized in adult literacy, helping countless people learn to read or learn to be teachers of reading.